The creation of this website is based on the work of several groups and individuals whose work is utilized under the Creative Commons license (or a similar agreement), or community members who have chipped in on the creation of this site. If anyone on talk radio outside conspiracy radio circle is getting the dialogue out there, It's Lionel commenting on the MSNBC appearance in a reasonable way. 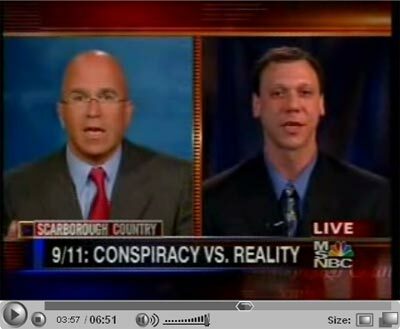 Mike Berger from 911truth.org was on Scarborough Country tonight on MSNBC. Scarborough was out tonight, and was replaced by Michael Smerconish. While MSNBC did play the collapse of WTC7 on national TV, something that has maybe happened once since 9/11, the video footage they provided was poor. While I only saw the clip we are hosting above and not the live feed on TV, it appears the clip of WTC7 they played was one of the worst out there. For those unfamiliar with the WTC7 collapse, you can find more video clips here and here. I have long heard rumors about Danish experts saying that there were bombs in the Twin Towers . . . but I couldn't track down the source material until now. I've finally found it. Nearly five years have gone by since it happened. The trial of Zacarias Moussaoui is over. Construction of the Freedom Tower just began. Oliver Stone's movie about the attacks is due out in theaters soon. And colleges are offering degrees in homeland-security management. The post-9/11 era is barreling along. What? Outdoor projected screenings of 9/11 films: 9/11 Revisited, elements from: LC2, 9/11 Eyewitness, and others. Who? Everyone. A great opportunity to meet others and discuss the anomalies of the 9/11 attacks. If you're anywhere in the Orange County area, please stop by!!! Note: Be sure to check out this Steven Jones clip for the new information he covered in Chicago.